Generally speaking, a wonderful DVD movie makes you think more than ever and gives you different visual enjoyment. However, it's seemingly easy to drive you into a great dilemma when it comes to enjoy new movies on DVD during a long plane trip while taking a great number of DVDs with you. In this case, it sounds a good idea to rip DVD to popular video formats so that you can make a schedule without taking too many DVDs. Among the numerous file formats, AVI leaves video enthusiasts deep impression. 1. Choice of codecs means you can achieve a high rate compression if you experiment. 2. Can be used as a starting point to create playable DVDs. 3. Excellent fidelity of the audio. 4. High compatibility with VirtualDub and Windows Media Player. 5. Widely used in business such as advertisement and promo videos. In case of seeking for a DVD converter, it seems to be more seductive when facing a free one. But is it really FREE? Does your video crisp go without any chopping? Don't worry. MacX Free DVD to AVI Converter for Mac is your ultimate solution to free rip DVD to AVI on Mac, which is regarded as the best-ever free DVD converter and DVD decrypter Mac for Mac users. You can convert DVDs locked by the latest DVD copy protections, like CSS protection, Sony ArccOS, CSS region protection, etc, which are the impassable barriers with Handbrake itself. Free download and run this freeware on Mac, just insert your favorite DVD and load your DVD through "DVD Disc" button. Alternatively, you can hit "DVD Folder" to import DVD files. In the output format area, select the target format "to AVI". You can also choose to MP4, to Music as your output format. Specify output folder on your computer to save the output files. Click the "Browse" to choose the path where you want to save the output files in. When the settings are done, click the "RUN" button to start ripping DVD on Mac. And then this free converter will automatically start to rip DVD to DivX or XviD in .avi file extension. Note: What if you want to convert DVD to MP4, MOV, FLV, etc for playback or storage? Never Mind! There are some other DVD ripper on Mac, which allows you to do this job. 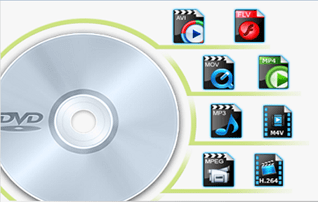 For example, the advanced version - MacX DVD Ripper Pro can do such a big favor for you, which can not only aid you to convert DVD to almost 300 video formats and 370+ preset profiles, but also support you to copy DVD with main/full title, clone DVD to ISO image for later DVD burning and more. AVI format videos is definetely incompatible for iPhone iPad. But it may or may not be compatibe with your Android smartphones simple because the different codecs. If you are luncky enough, you can directly transfer AVI files to mobile devices for playback. Or else you need convert AVI to MP4 or other mobile supported formats first and then move the converted videos to portable devices. However, with the help of MacX MediaTrans, an excellent iPhone transfer, you can convert and transfer AVI files to iPhone iPad at one stroke. It auto converts any videos including AVI, MKV, FLV, M2TS etc. to iPhone video format during the process of transferring videos from Mac to iPhone iPad. Step 1: Free download and launch MacX MediaTrans and then connect your iPhone to Mac with a USB table. Step 2: Click "Video" icon on the main interface and you can view all your videos on Mac. Step 3: Click "Add Video" button to import your AVI videos converted from DVD. It's worthy mention that the iPhone transfer will automatically convert AVI videos to iPhone recognized formats in the transferring process. Step 4: Press "Sync" button to finally transfer AVI videos to iPhone iPad iPod for playback on the go. How to Free Rip DVD Movie to AVI on Mac? 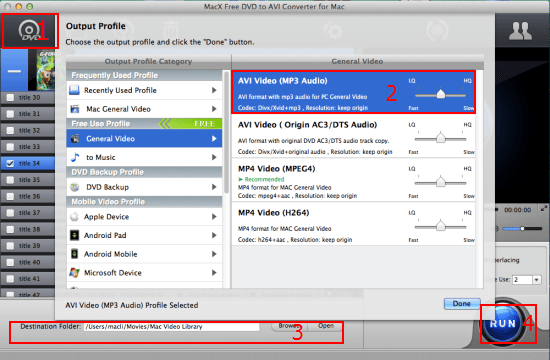 A full guide on how to free rip DVD disc to AVI on Mac and convert DVD to AVI fast with high output quality using the best free DVD converter for Mac. MacX DVD Ripper Mac Free Edition offers free DVD to MP4 ripping solution. For those who would like to know how to free rip DVD to MP4 on Mac OS could get introductions in this tutorial and free download this free DVD to MP4 ripper right now. Wanna rip DVD to XviD on Mac computer? This guide provides you the best DVD to XviD converter for the purpose of ripping DVD to Xvid on your Mac OS X with original quality. MacX Free DVD Converter for Mac is the best free DVD to AVI ripper which can freely rip and convert any new copy-protected DVDs to various video formats (MP4, MOV, MKV, AVI, FLV, etc) and portable devices with original quality.